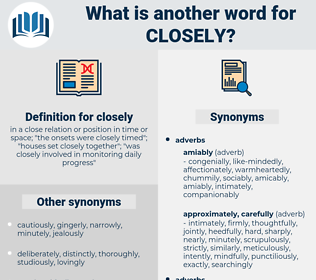 What is another word for closely? in a close relation or position in time or space; " the onsets were closely timed"; " houses set closely together"; " was closely involved in monitoring daily progress"
connections, contacts, requirements, levels, skills, changes, tasks, attempts. inextricably, strictly, intensively, intricately, narrowly, close, scrupulously, exactly, rigorously, nearly, collaboratively, stringently, intrinsically, accurately, approximately, duly, almost, integrally, meticulously, actively, directly, vigilantly, heavily, faithfully, inseparably, intensely, cooperatively, conscientiously, firmly, roughly, near, densely, clearly, highly, specifically, comprehensively, severely, vigorously, consistently, significantly, loyally, cautiously, very, keenly, earnestly, absolutely, properly, diligently, painstakingly, together, around, strenuously, cooperation, immediately, best, better, well, sharply, positively, perfectly, profoundly, finely, proactively, nearby, completely, fundamentally, inherently. carefully, thoroughly, precisely, strongly, extensively, seriously, deeply, fully, widely, largely, effectively, intently, broadly.
" I will look at it presently more closely. All these points should, therefore, be closely looked into.